A beautiful personalised nursery print featuring a sentimental quote, the childs details and a gorgeous photo of the child - the perfect new baby gift. 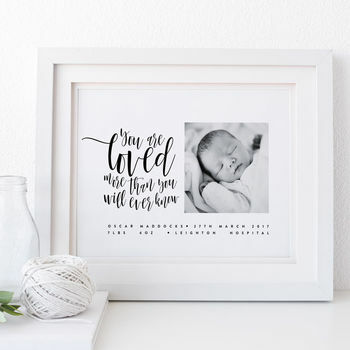 This print is the perfect keepsake to give as a christening, new baby or birthday present. Suitable for girl's and boy's with a large choice of colours available, such as blush, sage green, lilac and blue. Featuring sweet, hand lettered calligraphy.